Every January, Martin Luther King, Jr. Day marks one of the major volunteer service events for colleges, universities, high schools, and even elementary schools across the country. This event brings hundreds of thousands of people together to serve on MLK Day. 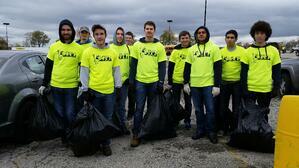 It has become a great way for students to work together in large numbers to better their surrounding communities. However, having an entire university population serve simultaneously is certainly not an easy accomplishment! If you’re planning a campus-wide service event for the first time, have one coming up this semester, or would like to initiate one in the future, here are a 10 tips from seasoned veterans to ensure a successful and meaningful event. 1. Plan early and check the calendar. “These events require extensive planning, research, and communication,” said Misti McKeehen, director of PittServes, a university-wide initiative to help build the culture of service within the University of Pittsburgh and their surrounding community. In addition to their MLK Day of Service and orientation service projects, PittServes organizes the university’s annual Pitt Make A Difference Day (PMADD) every October. Last year, more than 3,200 students volunteered with approximately 115 organizations logging over 13,000 service hours in one day. 2. Choose community organizations that allow you to build a long-term partnership. When choosing organizations for your large-scale service event, consider ways the partnership can become a long-term opportunity for your students, not just a volunteer option for the day. McKeehen said it’s important to work with your community partners and encourage them to discuss ideas about why your volunteer service is vitally important. Lewandowski said that 93% of the students who participated in their Orientation Day of Service are expected to volunteer again with one of their partner organizations, many of which offer work-study or service-learning programs. 3. Ensure service projects are meaningful and safe. It’s imperative that all community partners are fully aware of and agree to specific arrangements and commitments regarding providing meaningful activities in a safe environment. Partners should be able to share with the students why their service work is vital to their organization. 5. Communication is key. “Team leaders should call on partners throughout the planning process and the days leading up to the event to make sure everything is in order and that the organizations are ready for the volunteers,” said McKeehen. You don’t want to show up with a bus filled with volunteers and no one at the organization is ready for them – or worse, not even there! In addition, don’t forget to send out updates and reminders to your volunteers. Take advantage of social media sites to reach and recruit students. Send text alerts regarding start times or any last minute details. For example, if students are going to work outside around plants, trees, gardens, etc., make sure they have the proper tools and know to wear appropriate attire to avoid any potential mishaps like coming in contact with poison ivy! 7. Don’t forget transportation. If your budget allows, consider renting school buses or use partner sites within walking distance of your school. Lewandowski recommends doing the research to find a reliable transportation company. “Moving 550 people to 25 sites can get crazy,” he said. 8. Have clear guidelines, but remember to be flexible. Large-scale events make it somewhat difficult for individual students to actually choose their volunteer sites, but you could consider letting them request particular types of service. 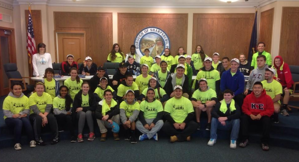 “When we have groups of students from sororities, clubs, etc., sign up, they are usually allowed to volunteer together at specific locations,” said McKeehen. 9. Always have a back-up plan. “Something always comes up,” said McKeehen. What happens if the buses don’t show up? What do you do if your students arrive at a site and no one is there? What’s the plan if it’s raining and your site is outside? Have a contingency plan and make sure your team knows what to do. 10. Remember to say, “Thank You,” to your partners and your volunteers! In addition, ask them for their feedback so you can make improvements for the next event! Have you organized a school-wide service event? 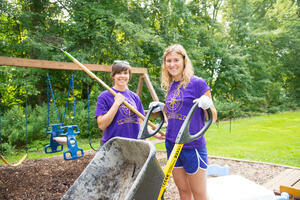 Tell us about your day of service activities and share your top planning tips with us! Need help managing your service program? 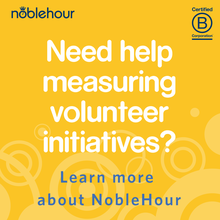 Learn how NobleHour helps build, manage, & measure community engagement!